You know I am a big believer in making every room in your home welcoming to every member of your family….don’t lock your kids out of the living room or pups out of the bedroom — or you won’t hang out in there either! That being said, I love the idea of creating a family room for kids that really fits their needs….but looks so fabulous that all the adults will want to hang out in there too! If you have a spare spot upstairs, dress it up as a second family room with comfy seating, storage, art table, room for wii games or ping pong. This room is a great excuse for that vintage Ms. Pacman game you have always wanted to own. Here you can live vicariously through your children! Also create a nook for them to be organized and productive in their own chic study hall. Here are a few rooms that I would like to call my own…and so would my kids! I love this study hall. It will just make your children want to study physics! This most beautiful elements, that add the most punch; the wallpaper, shades and chandelier, are well out of reach of the daily wear and tear! This is one of my favorite kid rooms! The ceilings and walls make it so crisp and clean and all the action happens below. This works for a playroom, study hall or tv room! Great idea to store all their stuff! 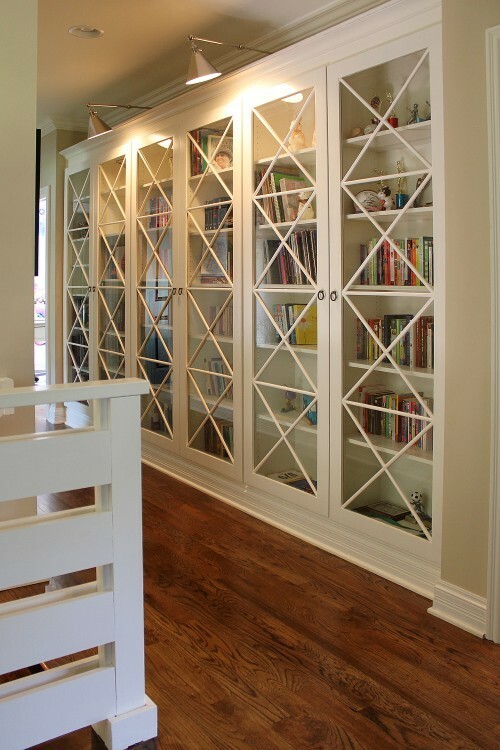 This storage solution could be part of any great room! Grown-ups and kids will want to cozy up in this book nook! What a great room to hang for them to hang out with their friends. A TV on the opposite wall would make it a great movie room!